In our turbocharged e-commercial world, branding has suddenly snatched centre stage. Riding piggy back on branding are best practices that deliver effective results, efficiently. I am a quality management professional. Amongst other skills, I know how to harvest best practices in an organization. I also know that branding is about mind-share. This mind-share is earned by consistent efficient performance of best practices. Unfortunately, our best practices have a finite life. They are benchmarked by competitors and swiftly replicated. Our differentiating best practices, that are characterized by simplicity, get commoditized very easily. Consequently, the earned mind-share of our offering is also threatened. The situation is more magnified and complex when one is dealing with digital-customers. They come and go at will. The situation gets even more complex when one is not aware of one’s own best practices. We tend to focus only on competitors’ best practices. That is a big mistake. It is important that we clearly know the correlation between our best practices and customers’ mind-share. Mind-share brings business. Therefore, best practices must be proactively and continuously developed into innovative next practices. It is critical to stay ahead of competition. This requires engaging the creative right-brain of managers for ideation and selecting strategic ideas to develop next practices. 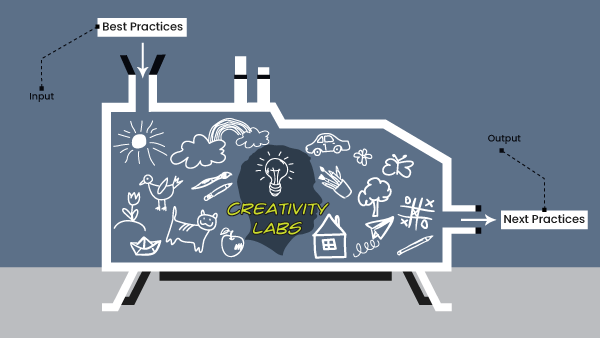 Creativity Labs are ideal for generating Best2Next Practices. They have delivered resounding success. In industry. In colleges. More importantly, Creativity Labs exploit the most underutilized asset of an organization – the creativity dormant in managers. Save your branding. It is difficult to earn. 2. Know your best practices and use Creativity labs to continually develop them to retain your competitive edge. Creativity Labs could also be one way to address the problem of employee engagement and tackling “burnout” resulting in loss of talent. Be proactive with your defined customers. Also generate an out pouring of ideas through Creativity Labs. Creativity Labs ignite the dormant right-brain of logical people. Will send you more details. Creativity thru design thinking processes seem to be possible way out in organisation.Can top leadership create a supportive environment to facilitate such processes across their organisation . Sustain these creative processes with involvement of teams across could be Next Practice to sustain competitive advantage . The first thing leadership should address – Nurture an environment that appreciates people with ideas. One in 200 ideas typically converts to an innovative solution.